When one enters into right relationship with the Spiritual Master, changes happen in the literal physics of one's existence. I am not just talking about ideas. . . . something in the physics of the universe makes it possible for a single apparent individual to pass through the entire affair of Divine Self-Realization, and then to bring others into the Sphere of the same Divinely Enlightened Existence, so that they may duplicate that Divine Condition. 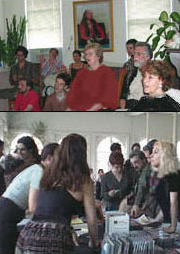 All Adidam devotees freely participate in an open esoteric school, a global community of practice, because they have received a revelation, Avatar Adi Da's Spiritual transmission, and not because they have adpoted a system of religious beliefs. Based on these revelations, we know that if true Spirituality is what you are seeking and you find this website holds your attention and "speaks to you," or if you find Avatar Adi Da's Picture and His Presence somehow familiar, or that His Words and Spiritual Teachings strike a chord; if you find that your heart opens to Him quickly, it's a wonderful thing. At some point in our lives, each of us found ourselves in the same or a similar position. Each of us wanted to know for sure whether what we thought we had come in contact with was the "real thing," and whether Avatar Adi Da Samraj was "That One." We wanted to know whether He could really lead us to direct Realization of the Universal Truth He Talks about—or not. Or whether He was the unseen mysterious guide we somehow knew had always been leading us along a seemingly solitary path towards Realization or Enlightenment. We all began by familiarizing ourselves with the literature of His Wisdom-Teaching. So you'll find links to that in abundance on our website. You can order His books online from our Books and CDs Page. Published by The Dawn Horse Press, Adidam's hard-working publications mission, you may also find them in a growing number of metropolitan bookstores. 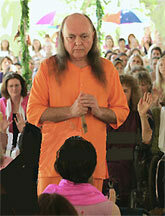 There are five principal steps that can guide you to the unique Spiritual relationship Avatar Adi Da Offers. Each step is described with great clarity in the new Dawn Horse Press publications, The Way of Adidam and Religion and Reality. You can also purchase these book at our frequently held Introductory Events. Whether you live in New York or are visiting this great city, please arrange to join us for an informal and informative evening (or afternoon) as soon as you can. Our devotee cooperative culture in the Tri-State Area centers around Manhattan, Brooklyn and New Paltz, New York. It is made up of people from a broad variety of backgrounds and diverse ethnic roots. Each member wants to share the Gifts he or she has received from Avatar Adi Da with you, because there's no better way we know to demonstrate our gratitude to Him. The natural inclination each of us has is to bring everyone in the world into relationship with Avatar Adi Da and with us. Love expands one's being. We truly hope that if you live in the Tri-State Area, you spend time reading what we have made available here, and that you contact us to participate in our lectures and classes, and that through this website, Adi Da Samraj brings a true blessing into your life. 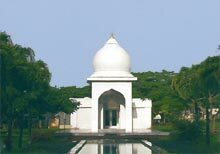 You will also want to know that there are large Adidam sanctuaries in California, Hawaii, India and Fiji, and Adidam regional centers and communities throughout the world. The sanctuary pictured at left is in Kauai, Hawaii. To find out more about Adidam's Global Community, or to locate the center nearest to where you live, please visit our main events page. Adidam is not a conventional way of life. Adidam is about the Freedom of Divine Self-Realization. Adidam is not based on mythology or belief. Adidam is a "reality" practice. modes of egoity are progressively transcended. Adidam is a universally applicable Way of life. and intelligence fully respond to Me and My Offering.